Because of the value of hatchery production to industry's harvest, and the mandate that hatchery production be compatible with sustainable productivity of wild stocks, ADF&G and private hatchery operators have recognized the need for a research program addressing concerns about escapement assessment, and genetic and ecological interactions between hatchery and wild stocks. ADF&G organized a science panel composed of current and retired scientists from ADF&G, University of Alaska, aquaculture associations, and National Marine Fisheries Service. Panel members have broad experience in salmon enhancement, management, and wild and hatchery interactions. What is the genetic stock structure of pink and chum salmon in each region? What is the extent and annual variability in straying of hatchery pink salmon in Prince William Sound (PWS) and chum salmon in PWS and Southeast Alaska (SEAK)? What is the impact on fitness (productivity) of wild pink and chum salmon stocks due to straying of hatchery pink and chum salmon? The science panel designed a long-term research project to potentially answer some of the questions. A study plan was prepared and ADF&G solicited proposals from entities interested in conducting a research program to address interaction of wild and hatchery pink and chum salmon in PWS and SEAK. The current research takes a long commitment and a considerable amount of funding. The legislature has appropriated a significant portion of the funding needed to ADF&G in FY 2013 Capital Budget from the General Fund. Alaska's salmon processing community has committed to a similar level of support. Prince William Sound Science Center (PWSSC), in conjunction with Sitka Sound Science Center (SSSC), submitted the successful proposal and the contract was approved to conduct a portion of this project. Work on this project began in the summer of 2012. In the winter of 2013, PWSSC will present the first annual report for review by the science panel and department. The science panel will continue to advise the department on how to proceed. As annual reports are provided, they will be posted on the website (see Findings and Updates Section). The ADF&G genetic policy has safeguards to guide enhancement to ensure hatchery stocks are similar in genetic makeup as other salmon in that region. 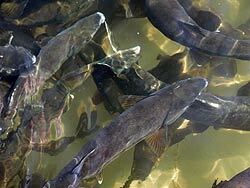 Policy guidelines include the use of local stocks, taking broodstock from all portions of the run to maintain genetic variation, and requiring sufficient numbers of spawners, but there has been no evaluation of the differences, if any, between hatchery stocks and other stocks in the area. The ADF&G Gene Conservation Laboratory will take the lead on proposed genetic analyses, beginning with an evaluation of the genetic population structure of pink and chum salmon in PWS and SEAK. The labs archived collections include many samples, but some additional samples will be needed for this analysis. 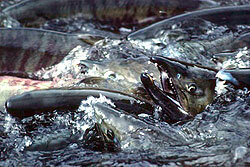 What is the extent and annual variability in straying of hatchery pink salmon in PWS and chum salmon in PWS and SEAK? production of wild salmon (excluding hatchery strays). These new projects involve sampling in both the ocean and streams to estimate two statistics: the fraction of the total run and the fraction of spawning abundance composed of hatchery salmon. These two fractions can be expressed as functions of catches (which are known), broodstocks at the hatchery (which are known), and escapements to natural spawning systems (which are not). 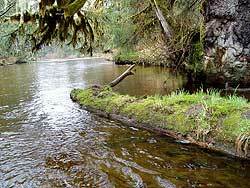 A minimum of five years is envisioned for estimating the scope of straying, after which time the costs and benefits of continuing to collect information on pink and chum salmon runs at this level of resolution can be evaluated. Research is needed to evaluate potential changes in populations of Alaskan pink and chum salmon due to straying of hatchery produced fish. Fitness is a statistic that describes the ability to both survive and reproduce. Genetic analyses have improved to the point where individual fish can be traced to their respective parents, so long as their parents have been genetically sampled. The science involved is identical to paternity evaluations conducted in humans, and will take advantage of the polymorphic DNA markers that can be used to identify individual fish and their relatives. Thus, the combination of thermal marks on all hatchery-origin pink and chum salmon, coupled with application of current genetic techniques, provides a means to set up a robust experiment to evaluate fitness of natural-origin versus hatchery-origin salmon spawning in the wild in streams of PWS and SEAK. Using the genetic tools for parentage, reproductive success to the fry stage can be estimated for hatchery-origin versus natural-origin fish in each stream, as well as provide data for comparisons between low and high stray rates for each of the two species with replication. These data will be used as well to estimate survival rates and reproductive success to the adult stage for hatchery-origin versus natural-origin fish in each stream. For more information on genetics and thermal marks please see our Gene Conservation Laboratory and Mark, Tag & Age Laboratory pages.